Navratri is dedicated to Durga, the Goddess of Shakti and her nine forms. It is known to be a holy festival of the Hindus and last for nine nights. 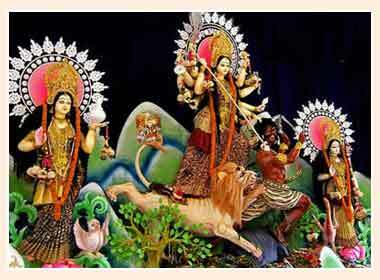 Navratri festival is observed twice in a year, once in the month of Chaitra and the other in Aswayuja. Devotee of Goddess Durga observes fast throughout the nine days and Brahmins are fed. People celebrate this festival by offering devotion at the feet of the Goddess. This festival is celebrated in a traditional way and it symbolises health and prosperity. 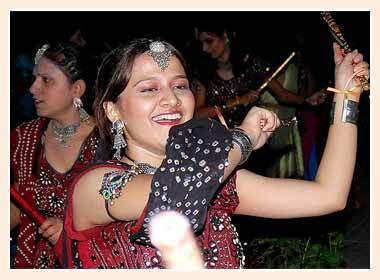 The main highlight of this festival is Dandiya and Garba Rass. Sweetmeats are prepared and people dress up in bright-colour dresses for the celebration of Navratri.